Much of the Bohannon Class of the 1952-1953 era (names courtesy of the amazing memory of former teacher Paul Toops). Back row, L-R: Judith Taylor, Nancy Kasbeck, DeEtte Sandner, Darlene Dunaway, Lillie Mae Rufener, Jimmy Wray, Gregory Trachta, Latrelle Walker, Claire Wray, Bobby Rufener. 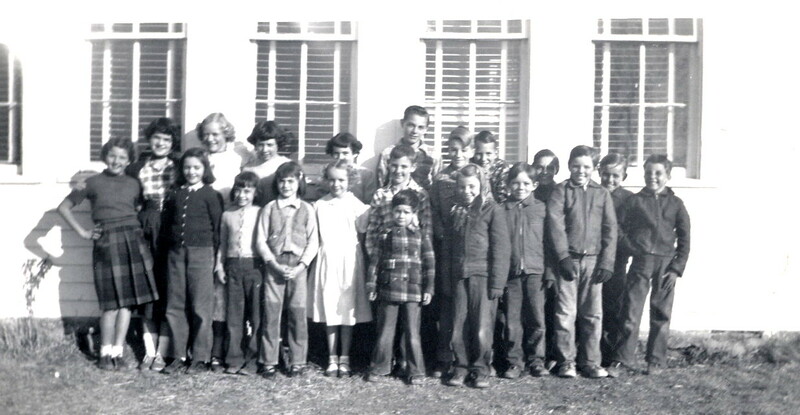 Front Row, L-R: Ina M. Taylor, Marlene Wray, Elaine Wray, Bonita Sandner, Billy Hoffman, Lindell (Bitsey) Rufener(in very front), Deanna Hoffman, Wendell Rufener, Donnie Dunaway, Harlan Dunaway. 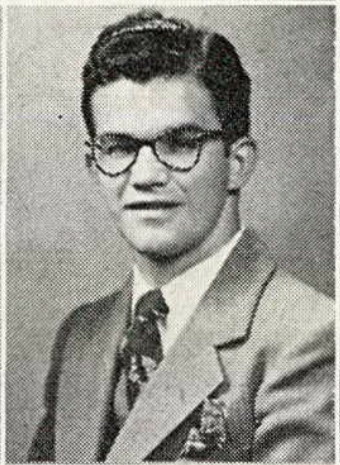 Joe Mitch (1933-1976) was from New Cambria, Missouri. 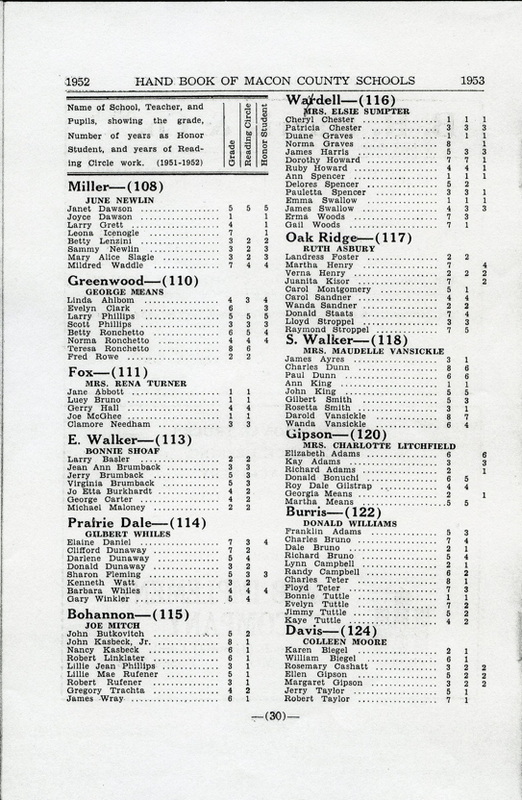 He attended high school there (his father was on the school board) from 1947 through 1950. He went to Northeast Missouri State Teacher's College in Kirksville, Missouri in 1951, prior to teaching at Bohannon. He returned to college the following year. After graduating he entered the Master's program and completed his thesis, "A Study of the Planned Progress Program in the Secondary School," in 1959. By 1965 he was on the faculty. He passed away in 1976, and there is a memorial scholarship named for him. Joe Mitch's influence at Bohannon, with those that knew him, exceeded the time of his tenure. His willingness to share his experiences and thoughts with the class left lingering memories, and probably lingering concepts of how to live life, among his students. It was the opening era of the cold war, and Joe made his allegiance clear. He let us know that fairness and equal opportuntity were more important than equality of outcome. "Be happy you live in a country where there are very rich people. Don't be jealous of them. You can do it too, if you want to." He sometimes speculated on the future, saying he hoped to see the year 1970, an era so far in the future to his young students it seemed like eternity. How he picked that date, is unknown, but we're happy to see he made it. 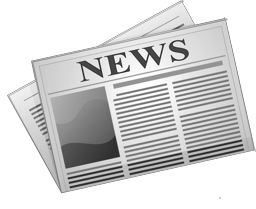 Mr. Mitch adapted himself to the local culture as seen in this news account. 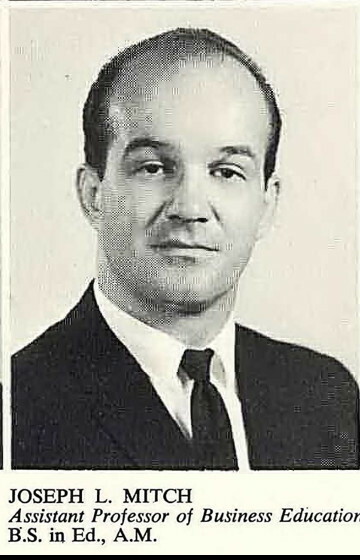 Joe Mitch in 1965, at Truman State College in Kirksville. 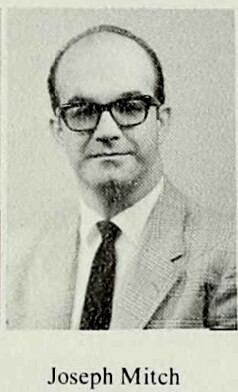 Joe Mitch in 1970, at Truman State College in Kirksville. The Kasbeck family moved into the region about this time. They were very sophisticated people, comparatively speaking at least. Nancy rode a Schwin bicycle to school. Bikes were not that common. We had one, what was called a "racer" bike in those days, which Dad had ridden in California during the war when gasoline was not available. In those days it had a basket, and Dad used to set me in it (I was about two) and go wobbling off to the corner store, a thoroughly frightening experience. On the farm, the dirt roads were so rough and irregular bikes didn't do well. It was usually faster to walk, but Nancy's bicycle was low geared and had fat tires, and it sailed over the roads with minimal effort, and few crashes. She wore glasses, which was a novelty, among us farm kids. Nancy's brother Jack was two years older, and he graduated during this year. He was that year's class entertainment, and definitely a class act. Frankie Lane's recording of "Wild Goose" was popular and Jack found opportuntities to break into song during class time, "I must go where the wild goose goes," with such exuberance no one could object too much. The Kasbeck family was still in the area in 1955, but they moved afterward, perhaps to California. Jack Sr. and Edna Kasbeck appear in Santa Maria, California in the late 1950s. He is working as a Missile mechanic at Douglas Aircraft, Vandenburg, AFB. 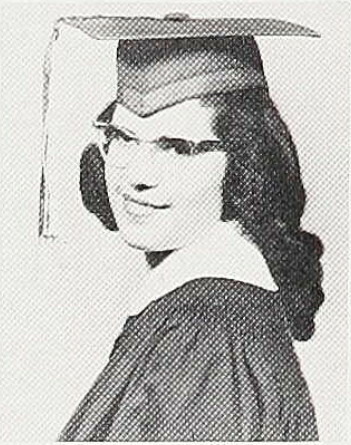 Nancy appears as a senior in Lawndale, California, in 1958. Regrettably, young Jack Kasbeck appears to be the same one who died in a service related traffic accident in 1962. Perhaps Nancy will see this web site and forward some memories of her own. 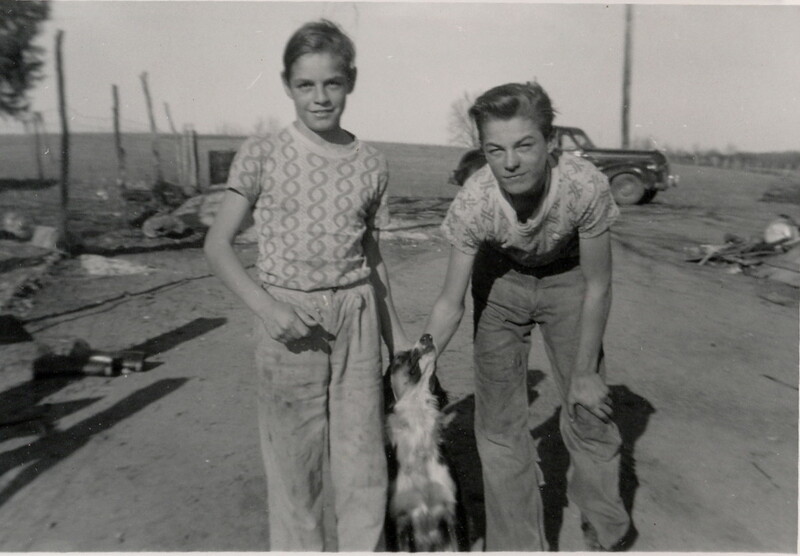 Claire (left) and Jimmy Wray in the Trachtas yard between house and barn, holding Mike, the Trachtas dog, for the picture. The car in the background might have belonged to the Trachta grandparents, Tommy and Mamie Stasey, who lived in the area. The Hoffmans were another new family, living up the cutoff to the Walkers place. They had a Shetland pony, which we sometimes rode. He was an old, balky creature who didn't seem to much care for all the attention we gave him. I made the mistake of getting behind him once, and he belted me in the stomach with a lightning strike I never saw coming. I lost interest in riding him after that. Deanna's brother, Billy, and I were good friends, finding quite a lot to do together during the recesses, and sometimes collaborating on school work. 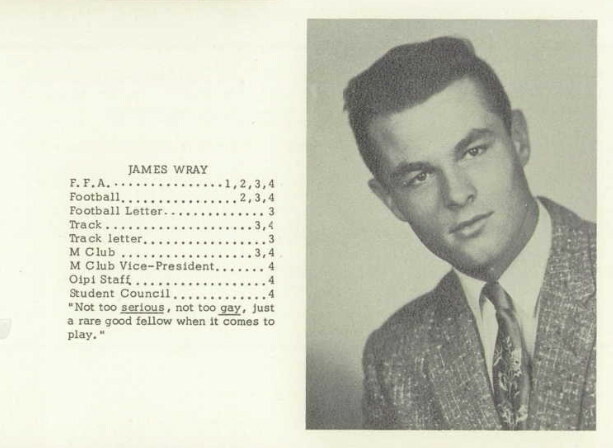 Jimmy Wray and his brother Claire were also excellent friends of my brother and I. We had a good many adventures on the surrounding farms, and particularly down in the bottom lands of what we called Mad Creek. We caught miserably tiny things we called perch, or sun fish, full of bones, but tasty. There were a few catfish as well, but they were so ugly I hated to catch one. There were also a number of large bull frogs that Mel caught, getting our mother to fry up the legs for a much anticipated morsel or two. There was also an enormous snapping turtle we attempted to snare, but he always eluded us. Jimmy Wray passed away in 2017, but I hope we get some memories from his brother Claire or from his sisters. 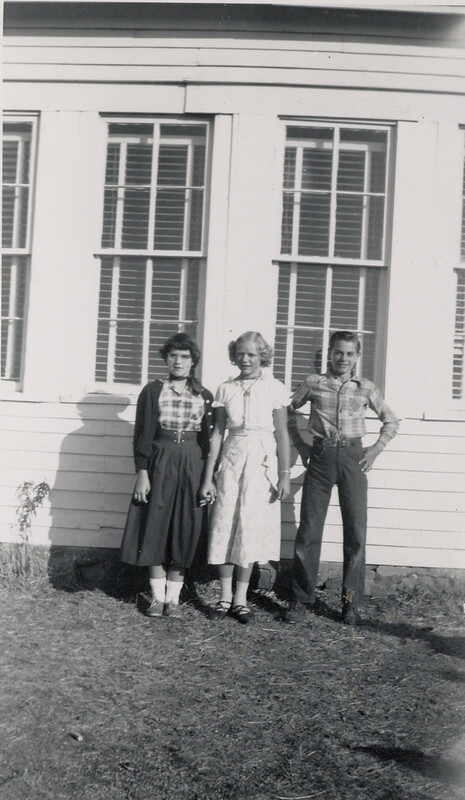 Robert Linklater, Bobby to his classmates, was an outlier at Bohannon School. The Malcolm Linklater family moved onto the Emory Graves place from Chicago. They were in the area before and after this school year, but Bobby attended only the one year. His parents were active in the PTA, and in local social events. His sister Rachel was married in Anabel, to a local boy. But Bobby seemed to belong to a different culture. He was a behavioral challenge to Mr. Mitch, and seemed like a city boy to those who milked cows, and chopped firewood. I remember he had a bicycle with one of those female silhouettes like you sometimes saw on truck mudflaps. The paper says he won a prize in the local circus raffle the following summer, but what became of him is unknown.